The taxman is researching the public’s views on globalisation and fairness in the tax system. Questions had included where respondents sit on the political spectrum, prompting questions of whether taxpayers are funding sensitive political polling. . .
After days of defending the research, Inland Revenue conceded on Saturday night that it was wrong to ask the political question. “We should not have included the question about political spectrum,” group head of communications and marketing Andrew Stott said, adding that the department would not include the question in its research. Inland Revenue was forced to reveal details of the $125,000 research project it is undertaking with polling company Colmar Brunton, after repeatedly playing down its significance. . .
A tweeter who was polled said she was also asked how much she trusts Air New Zealand and Fonterra and if large companies are paying their fair share. IRD has admitted it was wrong to ask about political affiliation. Are questions about trusting two businesses and whether large companies are paying their fair share any better? What relevance would that have to IRD’s business? Why would views on these matters matter to it? IRD should be concentrating on policy and advice and leave politics and spin to the politicians. Labour’s honeymoon is over for now. National is back in front of Labour but the three parties in the coalition are still comfortably ahead of National and Act. Successive polls are showing National at around 50%.
. . . In the final month of polling in 2011, we averaged 52.1%. On election day, we got 47.31% – a drop of about 4.8%. In the final month of polling in 2008, we averaged 47.1%. On election day? 44.93% – a drop of about 2.2%. In the polls currently taken in the month before E Day, we are averaging 48.91%. The polls that dragged the mean down in the final month of polling in the previous two elections (the ones taken in the final two weeks), have not been taken yet. The polls may go down. We may lose support. E Day could be worse. If we expect previous trends to repeat themselves, we are on track for an MMP, nail-biting, screaming-at-the-tv, 1 seat majority, hum-dinger. . . The election result is very, very unlikely to be as blue as the polls are painting it. An outright majority was very rare under First Past the Post. It hasn’t happened yet under MMP and is very unlikely to this year. 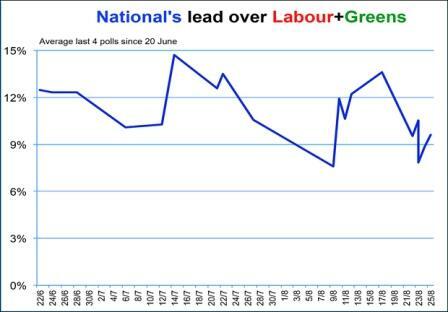 The trend for Labour is downwards but if National’s vote drops much below the polls, we might not get a John Key- led government and it could be possible for David Cunliffe to cobble together a coalition with the collection of mis-matched parties on the far left. Two new polls have affirmed a moderate downward trend in National’s support since July — but only to a still-high level of support at which to govern it would need, at most, support from ACT’s and United Future’s single electorate seats. 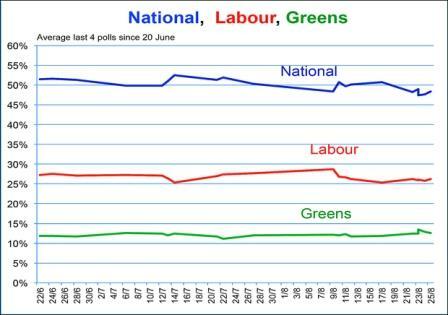 National’s latest four-poll average was 48.4%. Labour looks to be troughing. But it also appeared to have troughed in July, only to drop again in early August. Its latest average was 26.2%, below its whole-of-2014 average of 28.8%. The polls in the latest four-poll average were all taken after Nicky Hager’s Dirty Politics book was launched on August 13 but before Judith Collins’ sudden resignation on 30 August. The latest midpoint between the start and finish of interviewing was 25 August. Amidst all this, the Greens held steady at a 12.5% average, which would net it 16 seats, half of the total Labour could expect on its reading. The two winners from the fallout from National and Labour have been New Zealand First, average 5.2%, and the Conservatives, average 3.1%, both slightly down from recent peaks. Internet-Mana was 2.6%, the Maori party 0.9% (not enough to bring in additional seats to Te Ururoa Flavell’s electorate seat unless other candidates win electorate seats), ACT 0.4% and United Future 0.2%. A Maori Television poll has Maori Party leader and sitting MP Te Ururoa Flavell with 50% support in Waiariki. The Maori Party has voted with the opposition more than the government. But given the choice of working with a National-led government of propping up a Labour/Green/NZ First/ Internet/Mana one it is almost certain to opt for stability and certainty rather than instability. A new Fairfax Media-Ipsos poll published on August 15 again had Labour at a basement rating – 22.5% – and National cruising at 55.1%. But the poll-of-polls scarcely budged because that poll replaced a July Fairfax poll with closely similar readings. Still, Labour’s average, at 27.1%, while off its mid-July lows, remained dire, though the interviews for the poll straddled Labour’s campaign launch on August 10. Labour will worry whether other polls due in coming days replicate the Fairfax. National’s average did not change from its 50.3% in last Saturday’s averages. . .
. . . It shows National still in the box seat, with 50%, but down 2 points. Labour is also down 2 points to 26%. The Greens have moved up 1% to 11%, while New Zealand First has moved up 1% to hit the magical 5% mark. 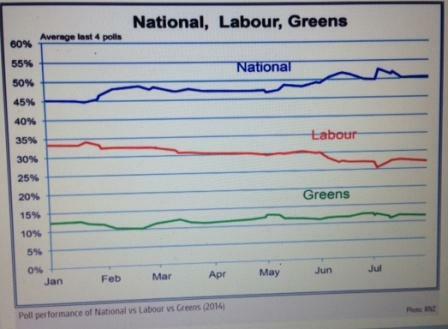 But the big mover is the Internet Mana party which has doubled in support to 4%. The Conservatives are steady on 2%, while the Maori Party, and Act remain on 1%. At 4%, and assuming Hone Harawira hold his seat, Internet Mana could bring in five MPs, including John Minto and Annette Sykes. . . These aren’t big changes for the major parties and IMP’s rise could help National by scaring those wavering in the centre its way. However, the message in both these polls is that in spite of the continued popularity of National and its leader, Prime Minister John Key who has almost five times the support of Labour’s David Cunliffe, the election outcome is far from certain. 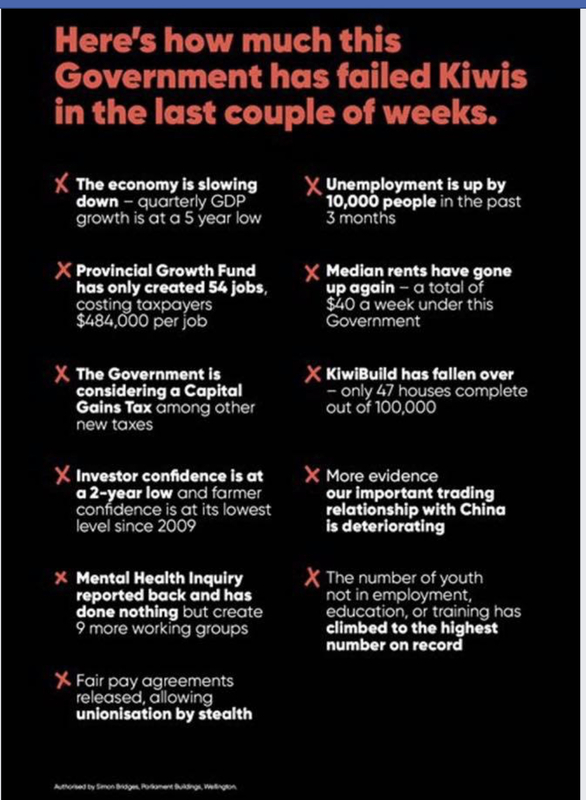 If there’s a silver lining to the sideshow of the last few days and a softening of support in the polls it is that it is helping National get its message home to supporters that there is no room for complacency. People who want a National-led government and/or don’t want the alternative of a weak Labour Party propped up the the Green, NZ First and Internet Mana Party must vote and vote for National.